THE 2018 ANDREAN MAGAZINE IS NOW AVAILABLE ELECTRONICALLY. The policy has always been that leavers joining the Old Andrean Club receive the annual Andrean magazine. Unfortunately, many of the printed magazines that we post every year are returned to College due to the unreliability of the postal service and out-of-date address details which, in addition to the continued increase in printing and postage costs (especially international postage costs), makes the printing of the Andrean a costly exercise. This year we have enhanced our digital version to include videos, sound bites and many more photographs than in the printed version for a better enjoyment of the Andrean Magazine. 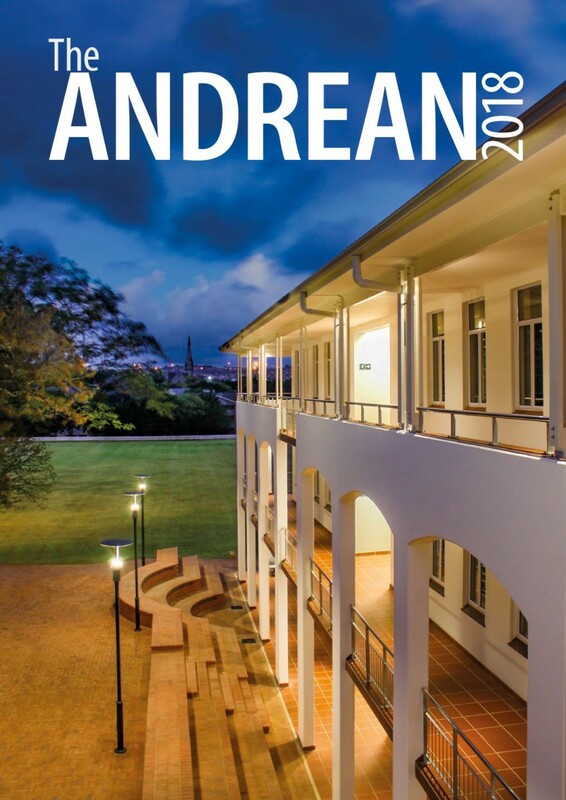 Should you have any questions, comments, or suggestions for the OA section of the Andrean magazine, please send them to Liezel Coetzee at l.coetzee@sacschool.com. PLEASE CLICK HERE OR ON THE IMAGE TO READ THE MAGAZINE WITHIN YOUR WEB BROWSER. Once open, the option is available to download an electronic copy [80 MB].